One show combines the best of stand up comedy and battle rapping. Featuring comics that are not only hilarious, but can also rap their asses off. Comics perform stand up, riff and rap on audience suggestions, and battle until one winner remains.The brainchild of popular comedic rap group Vanilla Presley’s Lane Krarup & Pat Sirois, this truly is one of the most unique comedy shows in town. 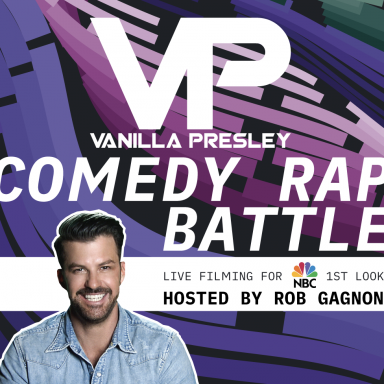 This will be a very special edition of the Comedy Rap Battle, as it is being filmed for the NBC TV Show, 1st Look, which airs right after SNL. NBC’s 1st Look stars Johnny Bananas, where each episode he is thrown into something completely new, and he has a day to figure it out. For this week’s episode, he is coming to Austin, and diving head first into a Comedy Rap Battle. In one day, Vanilla Presley will give Johnny a Rocky-style montage of rap battle training, and then pit him against Austin’s fiercest MCs. Tickets are $7, this event will sell out. There may be a handful of tickets left at the front door the night of the show, but we strongly encourage you to buy tickets online to reserve your spot. This show will feature live filming for NBC. By attending this event, you are consenting to being filmed as part of the production. As this will be aired on network TV, please avoid shirts with logos. Heckling or talking during the show will also be strictly prohibited. With that being said, please join us for this very special evening of Comedy, Rap, and Johnny Bananas!